Well a couple of apologies are in order here, first for the lateness of the posting. I was out of town from yesterday afternoon until late afternoon today and was catching up on some other stuff. It was a business trip up to Portland and let me say, the area up there is beautiful. And the weather so much cooler up there than here in the San Gabriel Valley! 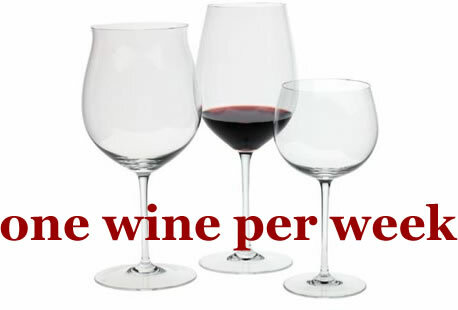 Secondly I apologize for the long, long title of today's post but blame it on the winemakers. At least I don't have to apologize for the picture like I usually do. It came out pretty good, I thought. That's not my fingerprint smudged on it, that's the label. 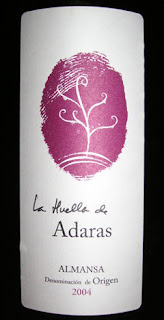 Today's wine, the 2004 Bodegas Almanseñas Almansa La Huella de Adaras, was $8.99 from the L.A. Wine Company. This does not appear to be a very common wine and its only my own notes that appear on Cellar Tracker. You can click here and here for more information on the web. This wine comes from the Valencia region of Spain and is apparently composed of 40% monastrell, 40% tintorera, and 20% shiraz (at least that's what the 2005 is and I'm just guessing at the 2004). Monastrell is the same as what the French call mourvedre. Colorwise, this wine was a beautiful dark violet/purple. On the nose I perceived juicy black fruits, along with meaty, smoky, cedary aromas. It was more of the same on the palate, plus a brambly component and a bit of chocolate. Initially smooth and fruity, the tannins and acidity emerged at the end along with a long, graphite-like finish. Nice texture. Sounds pretty complex, huh? The fruit and meaty qualities were the most prominent and the other parts were more subtle but they all combined to make this a really nice wine. And for $8.99, incredibly good QPR. If you can find this anywhere I'd recommend it. The average value per Cellar Tracker, of 4 users, is $12.68 so I guess I got a bargain at the LAWC. This is a no-brainer two thumbs way up!